With 15 beers on tap and over 100 types in bottles, Bières et Compagnie had won me over before I even walked in. It was recommended to me by a friend who also praised their food, particularly their specialty – mussels. The menu has 30 different preparations of mussel dishes including many of which are prepared in… you got it, beer. We walked in on this night – the very first snow in Montreal – planning on a liquid diet of beer. After our first few pints of Krombacher (German Pilsner) and Sapporo (Japanese Draft), we were quickly enticed to order some food. We had the European hot dog, toulouse sausage with fries and house sauerkraut as well as the European Hamburger with Griffon Beer raclette cheese, house sauerkraut, house dijon mustard and spicy chili mayo. 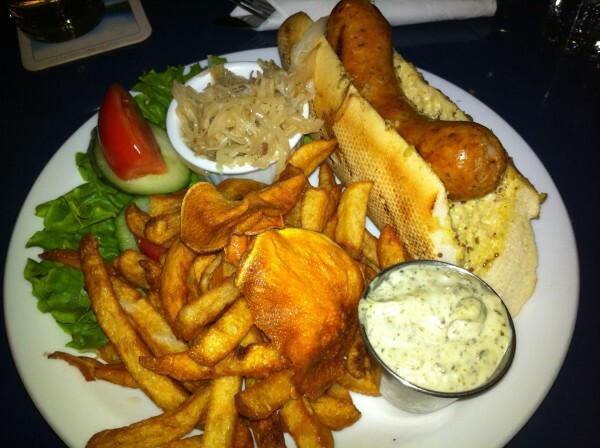 The sausage was charred and juicy and the house sauerkraut was amazing – an perfect companion to my Krombacher german pilsner. The burger was cooked medium rare and tasted great as well. As we were eating we were surrounded by mussels being served to the majority of the diners and so it is my mandate that I return to try the mussels – the smell was delicious. Great spot for adventurous beer drinkers and mussel enthusiasts. We don’t have enough places like this in Montreal. Tags: Beer, Burger, Fries, Hot Dog, Montreal, Mussels.